This week we are having a simple menu perfect for busy families. I hope you find recipes you live in our Simple Weekly Dinner Plan Menu #79! I will not lie, cooking is one of my favorite things in the world to do. Bonus, my husband does the dishes each night I cook, so that alone is just the boost I need to get supper on the table. This week we are so busy, even more than usual. We are heading toward Easter and like to get lots of work finished so we can make time for family! To help alleviate some of the stress my menu is filled with family favorites that can easily make leftovers for lunches the next day or even another meal. Creating a simple recipe menu plan is key to a successful week of healthy meals at home. 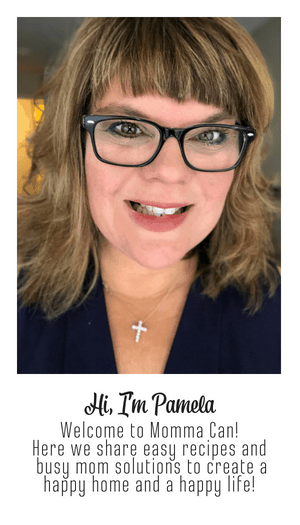 Big plus, you will save money! I mean even the cheapest fast food restaurants are now seven bucks a combo or more! And let’s face it, burgers, fried chicken and fries are really not that great for you all the time! The buns are huge! When you eat a burger or hotdogs at home you can read the packaging and choose the best meat and buns for your family. So, yeah, go ahead and have a burger, but have it at home! We love our burgers and hot dogs with fresh home-baked fries, sometimes we even slice carrots and add them to the pans. Carrot fries are amazing with a hint of olive oil and a bit of rosemary. Leave a few raw carrot fries for your picky eaters and dinner will be happy! 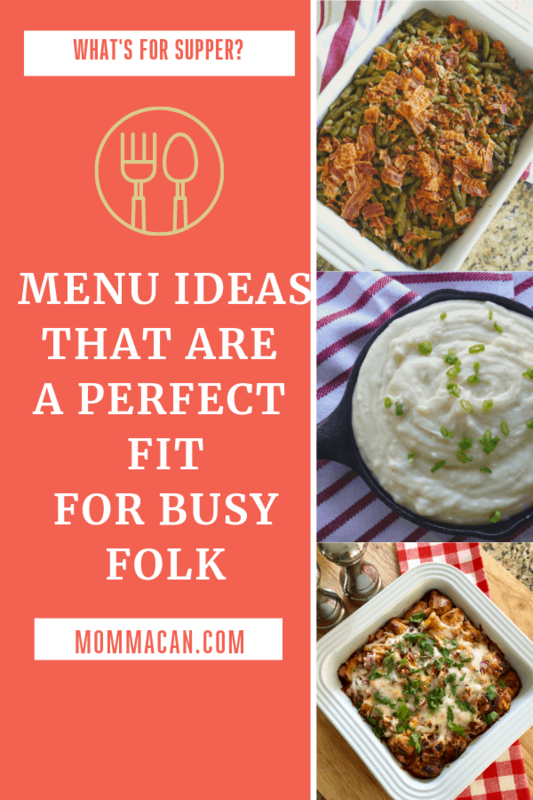 Let get to planning our Simple Weekly Dinner Plan Menu! Here is our Weekly Dinner Plan! Monday – Hot Dogs with carrot and potatoes fries served with a Sriracha Dressing and Iced Tea. We buy nitrate free turkey dogs and whole grain hot dog buns. Yum! I can usually find a good turkey hotdog at most groceries. 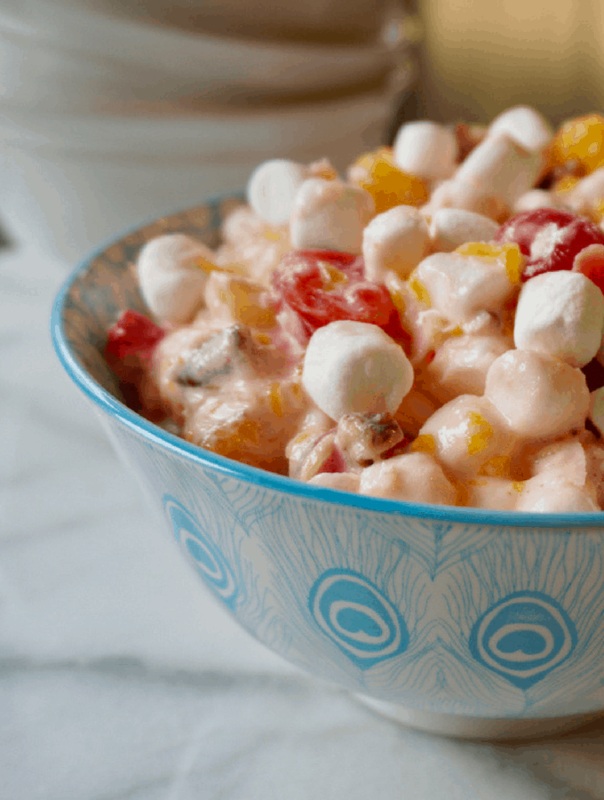 I might even make a big batch of Tropical Fruit Ambrosia Salad to have in the fridge for lunches and one more dinner! Here is a great recipe for carrot fries. 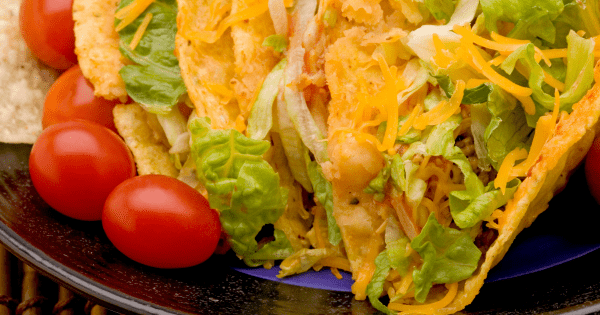 Tuesday – Tacos with a Fiesta Corn Salad! I love tacos and I love salad, why not have them both? I make extra salad fixings to last for the next couple of days. This helps save time during the week. I grab some chopped greens, diced tomato and red onion, and any kind of veggie I have in the fridge that needs to be eating and make a big salad. ( note I add the tomato last and do not add tomato to the extra salad for lunches the next day) Tomatoes don’t do well in the fridge. I know bummer. We make some yummy spicy fiesta ranch dressing. It is stupid easy. 1 cup ranch dressing, several shakes of Tabasco, and 1 big heaping tablespoon of chili powder. That’s it! And it tastes amazing! The salad is fresh chopped salad vegetables and greens, 1 cup thawed frozen corn, 2 cups Fritos or Crush Tortilla Chips and dressing on the side. Feel free to dice some avocado if you have it and put a few pieces on top. This is amazing! I really should write an official recipe. Note you can also use leftover corn on the cob. We have an amazing recipe for Oven Roasted Corn on the Cob here. I love fried chicken, but let’s face it, fried chicken is well, fried. And Lord knows we could all use a little less fried in our American diets. I found this amazing recipe for Oven Roasted Fried Chicken that is picky kid approved and I recommend it to everyone. It is amazing I pinky swear! 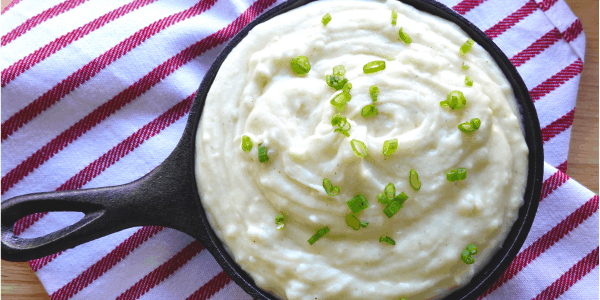 I serve it with leftover roasted corn, creamy homemade mashed potatoes, and green beans. I love this green bean recipe and eat the leftovers as a meal! They are so good! Thursday – Lemon Pasta with leftover fried chicken and a big salad. 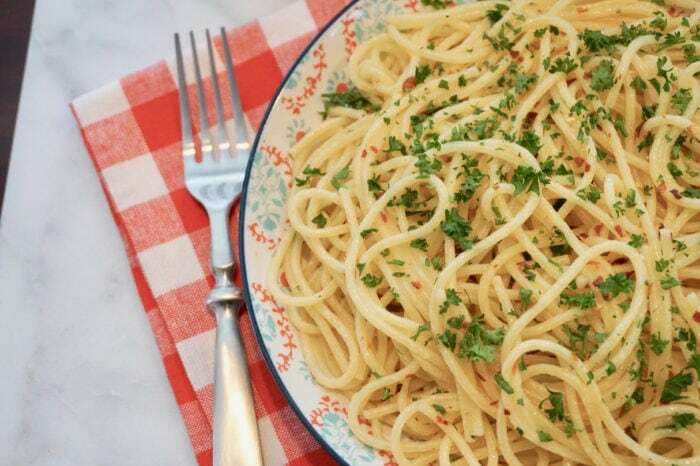 I make extra oven roasted crispy fried chicken legs and serve them alone side this yummy lemony buttery spaghetti recipe that my family loves. It is so good and I end up eating like a queen with my pasta, green beans and maybe even a bit of steam shrimp if I feel like making some super quick. 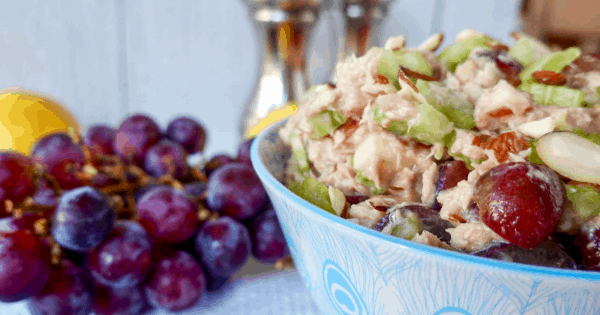 The Best California Style Apple Grape Tuna Salad Ever! Friday – Apple, Grape, Almond Tuna Salad with fresh croissants and homemade Cranberry Lemonade. My newest tuna recipe on the blog is amazing! I mean AMAZING! It is fresh and has juicy apples and grapes with crunchy celery and sliced almonds. It is yummy served on a bed of grains but off the hood on a freshly baked croissant. I am serving it with crunchy Hawaiian Style Chips and homemade Cranberry Basil Mint Lemonade. The pucker is real y’all and it is darn good lemonade. I love a tart lemonade and just think of all those vitamins waiting to be sipped and enjoyed! Saturday – Dinner Out – I am thinking Jamaican Jerk Chicken and Peas and Rice with a side of fried plantains. Yum! Mississippi Turkey Thighs – Cooked like a Mississippi Pot Roast but using Turkey Thighs! I made a nice roast the other day and used this recipe for Mississippi Pot Roast in the slow cooker. It was delicious and we will for sure make it again. This weekend I am going to make it with turkey thighs. and then use the meat as a main dish and the leftovers for sandwiches next week! I am thinking of a hoagie with sauteed onions and peppers and some good creamy cheese. For Sunday dinner we will have the turkey thighs with butter beans and sliced tomatoes. I am going to see if I can find some in-season watermelon! Luckily California has a pretty good variety of local fruit year round. 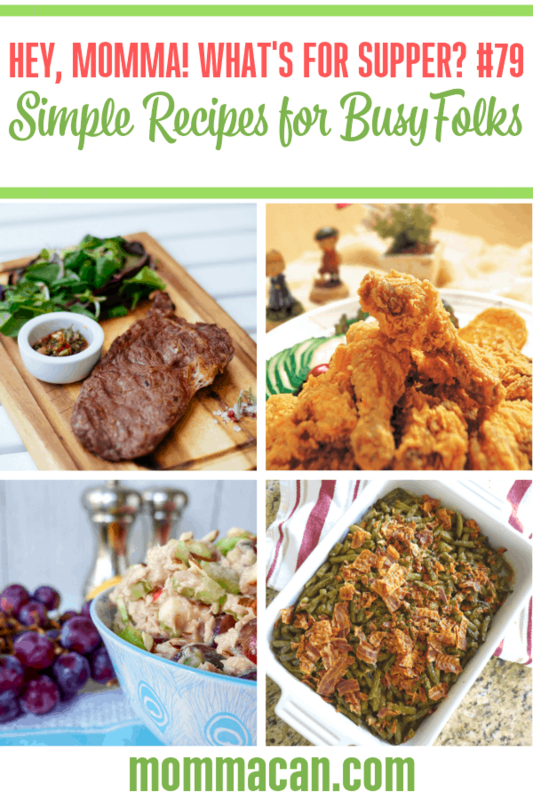 I hope you enjoyed our Simple Weekly Dinner Plan Menu #79! Each week is designed to inspire you to get cooking with the family! Cooking at home is healthier, cost-effective, and a wonderful way to bond with your family. What do you think about this menu plan Have questions? Comment below! Don’t forget to like us on Facebook, follow us on Pinterest and connect with us on Instagram and tag your @mommacan recipes with #mommacan, while you’re at it…I love to see your pics!